Buat.web.id - Pernahkah Anda membayangkan menjadi Android Developer Dan Ios Developer, sekarang sudah bisa terwujud, dengan berkembangnya Dunia teknologi informasi, banyak perusahaan ataupun perorangan telah mewujudkan hal itu, dimana sekarang sudah tidak perlu lagi Coding untuk membuat sebuah aplikasi Android dan IOS, tingggal drag dan drop saja Aplikasi Anda sudah bisa terwujud. Sekarang saya akan membagikan Tempat/Situs Untuk Membuat Aplikasi Android dan IOS Secara Gratis alias Free. Silahkan disimak. FREE service that converts your content into an App and makes you money.Your app will have all you need including messaging, social sharing, tabs and full support for HTML5 enhancements.But forget about the app, we help you build a business and profit from mobile! We help you monetize your content succesfully. One app is all it takes to reach customers on all leading mobile devices. Our platform lets you create a single app for iPhones, iPads, and Android phones and tablets. 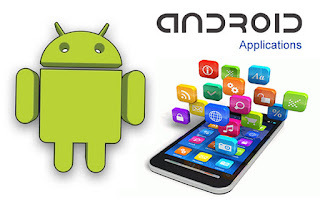 App Maker Appy Pie’s Android App Builder Lets You Create Free Android Apps Now Make Free mobile applications without coding for Google’s Android using Appy Pie’s Android app maker online. This online Google’s Android app builder will help you design your application step by step and using it requires no coding skill or previous experience of mobile app development. Appy Pie’s Android app maker is a drag and drop tool that makes the process of Android app development simple and pleasurable. Anyone can create a professional Android app. There's no programming knowledge required, only take few minutes to build your first app. All you need to provide is links to Rss/Atom feed or website, they are automatically converted into stunning 100% pure native apps for Android. You have freedom to list/sell app on Google Play and many other Android Markets. Earn Ad money with embeded Ad or get thousand of installations bring new constant visitors to your website. Have a great app idea that you want to turn into a mobile reality? Now, You can make an iPhone app or Android app, with no programming skills needed. With Appmakr, we've created a DIY mobile app making platform that lets you build your own mobile app quickly through a simple drag-and-drop interface. Millions of people around the world have already made their own apps with Appmakr. Get Started & Make your own mobile app today! AppMakr has turned millions of app ideas into real apps. Build yours today! Your users won't be. If you're going to make an Android app, do it right. Andromo is not a cross-platform app maker with cross-platform compromises. Andromo is smarter, faster and better. Andromo actually generates real Java code for each app you make, compiling it on our cloud servers using Google's official Android SDK. You get a stand-alone, native Android app - with no compromises. Even if you were to code your app from scratch, you'd do it like Andromo does. However, instead of spending months of time and thousands of dollars, you can make your app right now with Andromo. Baca Juga : Versi Android Dari Yang Terawal Sampai Yang Terupdate. Functionality and possibilites are endless. Use our templates as a quick and easy way to get started; customize when and where you need it.Get started in minutes with one of our many templates. Customize your app with our click and edit dashboard. Know that we're here to help every step of the way. Start engaging your users today! Want to turn your app idea into an app reality? You can make an iPhone app or Android app today, no programming needed, with Infinite Monkeys. We've built a drag and drop mobile app creation tool that lets you create iPhone apps and Android apps quickly through a simple drag-and-drop tool. Thousands of people have made their own apps with Infinite Monkeys. Create a mobile app today! Is your free mobile app builder. Free to all app builders and app lovers. Join now and start building your free mobile app today. Apps have become the must-have tech accessory for many people, and a core part of forward-looking business marketing plans. However, not many people or small businesses have the know-how or means to create highly functional and individualized apps that are ready to be published in popular app stores. Our apps can be made for any operating systems such as Android, Apple, Black Berry and Windows. Quick star : Your first application in 10 minutes, to discover Make me Droid, then at your own pace, improve your application with assistance from our support team. Create a powerful mobile app for your business to engage with customers when and where it counts. Go mobile today. A Prototype is a great tool that helps test your hypothesis, gather valuable user feedback and prepare the specs for the application development process. Building your Apps FOR FREE with Mobincube, we will include some ads inside them and you'll earn 70% of the revenue from advertisement. It's such simple: the more Apps you publish, the more money you'll make. Build your app once, publish for iPhone & Android. Create Build your amazing mobile app Mix MobApp modules to build the application you want and customize your design . Make Awesome Apps, Buzztouch is software and an amazing community that helps people make native iOS and Android apps. Unlike many "app builders", there are no limits to what kinds of apps you can make using Buzztouch. Keep the Code, Use the Buzztouch control panel to make an app, download the iOS or Android project, and you're off to the races. Use Xcode or Android Studio to install your app on your device. When you're happy, submit it to the App Store or the Google Play market. Native iOS and Android projects packaged up nicely for you to keep. Cool! Get Started Free.